The central premise of Sun Tzu's Art of War is that it is only through strategy that conflicts can be overcome and real victory achieved. We tell you what his treatise on military strategy is all about. The beauty of the kind of strategy, or bing-fa, as it is known in Chinese, taught by Sun Tzu is that you win by circumventing conflicts which usually end up being too costly. In other words, Sun Tzu's philosophy of strategy helps you to make wiser decisions in everyday life. It will train you to get your killer instincts under your control, reshaping it into a winning or profit-making skill. A strategy is the process by which we study exactly what will work in order to overcome challenges. It is a powerful tool which helps you to understand the thinking process of other people, which in turn assists you in predicting how they will behave in a given situation. By training yourself in strategy, you develop the mind of a strategist, which is able to think several steps ahead of the other people you deal with. This is what provides the winning edge. Even though Sun Tzu used a Chinese term which means "planning" to name the first chapter of his book, his connotation is actually nearer to what can be called "competitive analysis" in English. In the first part of the chapter, Sun Tzu explains the main factors that form the basis of competitive structures. However, all through the book, the interrelations between the factors are given as much importance as the factors themselves. Prior to waging war, there are a total of 5 elements which need to be examined in order to make a proper evaluation, or planning, to achieve success. Each of these is discussed below. Tao, which stands for "philosophy" or "way", is the core of factor of Sun Tzu's principles. In our day-to-day lives tao can be our central mission. It can form the uniting force in a competitive organization. If applied in business, for instance, tao helps to serve the real requirements of people, since the mission of the business becomes centered on them. It helps to attract customers, employees, supporters, and other associating allies. Basically, tao inculcates introspection which points towards the outcome of whatever action you may be contemplating on making before you actually commit to it. When thinking strategically, this is the key factor. The climate, or timing, in Sun Tzu's philosophy implied changes in the weather, seasons, temperature, etc. Although in warfare conditions the climate can be one of the most uncontrollable factors, a good leader, or general, will know how to utilize them most advantageously. He will pick the most opportune moment to fight, using the bad weather in such a way that it causes the most harm to the enemy. Likewise, this can be applied in our personal lives too. In order to succeed, we must capitalize on whatever the situation may be. Seize opportunities despite the conditions being in a state of fluctuation, beyond our control, and turn them into advantages. The CEO of a business organization, for instance, must be able to modify his strategies according to the fluctuations in the business or economic environment or climate. The terrain or ground is the area in which military operations take place. Although the battlefield can also be an uncontrollable factor, a good leader will know how to use it in such a way that it is most advantageous to his own men, while being the least advantageous for the enemy. Thus, just like the climate, one can make choices which can bring uncontrollable factors under our control. The same principle can be applied to our daily lives. The ground, or the situation we are in, is what we usually have to cope with. It is often where we conduct our daily battles, and what we battle over. In order to deal with situations that are not under our control we must be flexible and adaptable, and be able to turn them into advantages. By 'leadership' or 'command', Sun Tzu meant the abilities and qualities a general possessed. The commander is a representative of virtues like courage, wisdom, benevolence, sincerity, and strictness. A courageous leader wins by grabbing the opportunities that come his way without hesitating. A wise leader has the ability of recognizing changing situations and act accordingly. If benevolent, he empathizes with his men, and appreciates their toil and diligence. When he displays sincerity, his troops are assured of their just rewards as well as punishments. With strictness, he inculcates discipline in his men. The leader in any situation defines and creates his organizational unit by his skills of making correct decisions and his character. All the organizations we belong to, our systems, procedures and processes, are all elements of the methods we adopt, to survive and win. The methods we use must be effective and efficient, along with being consistent with the central purpose of our lives or tao. The Art of War is a combination of deep philosophy as well as detailed prescriptions for winning by using correct tactics. The treatise begins with the direction that: "War is a matter of vital importance to the state; the province of life and death; the road to survival or ruin. It is mandatory that it be thoroughly studied." Further on, Sun Tzu goes on to explain that deception forms the basis of all warfare. Hence, in order to triumph, one must pretend to be incapable, although capable, pretend to be inactive, although active. If you are near your enemy, make him believe you are nowhere close, if you are far from him, give him to understand that you are close by. 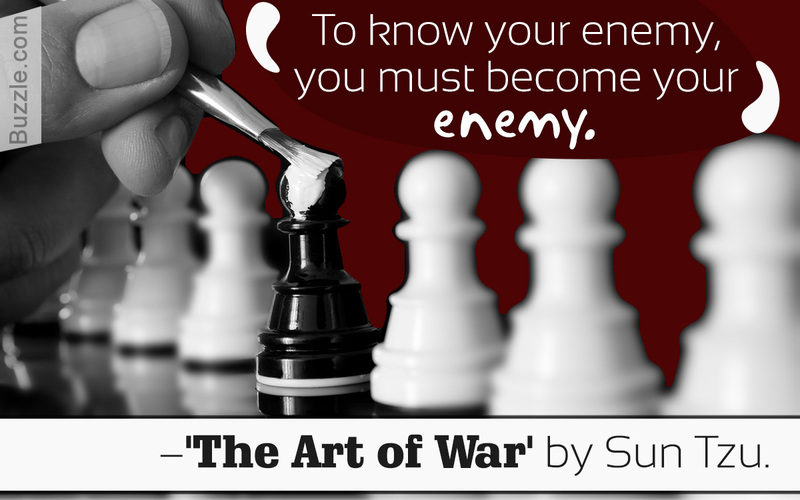 Sun Tzu was the pioneer of the "indirect approach" to winning in wars. Anyone who can master both the indirect and direct approach will be able to triumph over all odds. Although the topic of the treatise is war, but it can be applied broadly to any kind of competitive system in life. According to Sun Tzu, triumphing over any competition was a matter of surviving odds, and that survival was dependent on having particular skills, which can be acquired. Success in life, like in war, is largely based on the kind of relationship we have with the environment we find ourselves in, which are often beyond our control. Sun Tzu instructed that in order to be successful, one must be able to master all the elements that are not under our control, turning them into advantages. As Sun Tzu said: "For just as flowing water avoids the heights and hastens to the lowlands, so an army avoids strength and strikes weakness." There are in all 13 chapters of The Art of War; each of them provides us with powerful tools that can be applied to deal with business or personal obstacles, confrontation, and also human relationships. The book can be a useful aid for achieving success in business, career, and in life.